Published: Jan. 15, 2014 at 02:41 p.m. 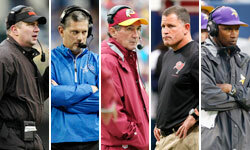 Updated: Jan. 15, 2014 at 10:05 p.m.
After Mike Zimmer was made coach of the Vikings on Wednesday, we posited that Minnesota's vacant offensive coordinator post loomed as the second-most important hire the organization will make this offseason. NFL Media Insider Ian Rapoport reported that Minnesota has been granted permission to interview Norv Turner, according to a source who's spoken with the coach. Turner remains under contract with the Browns, but Cleveland has given its in-limbo play-caller freedom to seek other work as they hunt for a new head coach. Turner wore out his welcome with the San Diego Chargers, but remains one of the league's premier coordinators. He helped the Browns finish with the 11th-ranked passing attack last season despite being saddled with quarterbacks Brandon Weeden and Jason Campbell after Brian Hoyer tore up his knee. He'd be an interesting fit for the Vikings. Turner has overseen the league's top rusher in five different seasons and would inherit the best back on the planet in Adrian Peterson. Turner advocates an aggressive, vertical passing scheme that could do wonders for young Cordarrelle Patterson across from aging receiver Greg Jennings. Kyle Rudolph is another potential beneficiary after what Turner has done with tight ends Antonio Gates and Jordan Cameron in years past. The absence of a difference-making quarterback casts a cloud over anything the Vikings hope to do on offense, but Turner would give Minnesota's coaching staff another proven commodity.